For centuries, international law has functioned as an instrument of nation-states working in concert, acting out of a sense of legal obligation. Since World War II, this combination of state practice driven by legal obligation—in the form of both treaties and customary international law—has served as a prime mechanism for shaping and addressing complex global responses to pressing planetary challenges. In practice, international law has helped to construct a system—exemplified by the United Nations, Bretton Woods, and NATO regimes—that has functioned as a critically important, system of global governance resembling that urged by Immanuel Kant in Perpetual Peace. It’s not a system of world government, but a community of free law-abiding nations trying to live together in a law-governed international society, collectively explicating shared moral commitments. 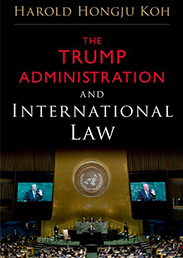 The time-tested approach—applied by most administrations before Donald Trump became president—called upon the United States to invoke multilateral compliance with international law rules as a source of smart power and global leadership. By so doing, the United States has traditionally: (1) engaged with allies around common values to forge a rules-based order for global governance; (2) translated from existing rules in situations where the legal rules are unclear, rather than pressing power-based solutions that rest on national interest; and (3) leveraged legal approaches with concerted multilateral diplomacy and hard and soft power tools to generate proactive solutions to challenging global problems. But Trump’s tumultuous two-year presidency has persistently pursued the opposite approach: “disengage – power politics – unilateralism.” Wherever possible, Trump has sought to disengage from global alliances, claim that no meaningful rules constrain or guide U.S. power, and eschew cooperative diplomatic approaches. Moreover, Trump has asserted a broad authority unilaterally to withdraw from the institutions of the postwar global order, which I have argued is not supported by law. This disruptive strategy —sloganized at populist rallies as “America First”— rests on Trump’s conviction that the United States has lost competitiveness vis-à-vis other countries in what he perceives to be a zero-sum game. He believes that globalization has left the American working class behind by allowing immigrants and foreigners to steal their jobs. Because America now bears too much of the burden of global leadership, to “make America great again,” he claims, the United States should offload much of it so that other nations pay their fair share. And because America has enough trouble dealing with its own problems, it should not waste energy judging or helping to solve the problems of others, particularly when other regional hegemons such as China and Russia are able and eager to take care of those issues. The resulting framework less recalls the Kantian system of global governance we inherited than the brutual “spheres of influence” approach depicted in George Orwell’s 1984. Viewed in global context, what becomes clearer is that Trump is not so much a cause as a symptom of a global trend taking hold not just in the United States, but around the world. The global rise of populist authoritarians and the global challenge to human rights and the rule of law have reached crisis proportions. A prominent global rule-of-justice index reported that fundamental human rights had diminished in almost two-thirds of the 113 countries surveyed in 2017. The same index assessed that since 2016, rule-of-law scores had declined in thirty-eight countries. In Austria and Italy, China, Hungary, Poland, the Philippines, Russia, Saudi Arabia, Turkey, and Venezuela, new global authoritarians have copied his playbook. These politicians demonize immigrants, disparage bureaucrats, intimidate judges, reward cronies, intimidate journalists, and claim that constitutional checks and balances must give way to the “will of the people.” Their concerted effort to undermine the rule-of-law institutions of the post-war legal order — whether the United Nations and its human rights mechanisms, the European Union, or global institutions of trade and security—has called the continued stability of the postwar system of Kantian global governance into question. The tumultuous rule of Trump and his ilk have put international law on the defensive. But international law is fighting back. Thus far, Trump is not winning. Across a broad range of policy issues—immigration and refugee law, human rights, trade diplomacy, climate change, North Korean and Iranian denuclearization, cybersecurity, Russian adventurism, and America’s wars—the law is pushing back against his assaults, leaving largely intact an uneasy status quo ante. Thus far, the resilience of domestic and international law and American civic institutions have largely checked Trump at home. But that resilience has been battered over the last two years, and might eventually give way should Trump be re-elected. So who ends up winning in the longer term—Trump or international law—will depend not just on who is stronger or more determined in the moment, but also on what is more resilient in the long run. How strong are America’s enduring civic institutions? Even in an age of rising authoritarianism, international law remains the prime mechanism for shaping and addressing complex global responses to pressing challenges. Perhaps one bellwether is the counterintuitive way in which the Trump administration has chosen to respond to the crisis in Venezuela. At this writing, the administration has engaged with allies and translated traditional international law to recognize Juan Guaido as interim president, trying to leverage diplomatic pressure to bring about a new election where Nicolás Maduro’s rule can be re-evaluated by the Venezuelan people. In short, in a crisis, Trump has resorted to “engage-translate-leverage,” the very Obama-Clinton strategy he has repeatedly disdained. Even if his commitment to that approach proves to be fleeting, it nevertheless shows the enduring influence of the durable notion that international law is smart power. Harold Hongju Koh is Sterling Professor of International Law at Yale Law School. Professor Koh is one of the country’s leading experts in public and private international law, national security law, and human rights. He is the author of The Trump Administration and International Law. The nations of the world can be judged by the friends they keep. No nation can succeed in the long run by promoting rouge states, brutal tyrants, and murderous dictators. Oh my. Unhinged demagoguery against “Orange Hitler” in OUPblog. Too many drinks before posting?